Autumn is here; Fall has fallen. Whichever way you know the season, it’s full of crisp air, football, and dramatic changes in your landscape. Not only are city streets and mountain drives full of fall color, but your lawn changes, too. When the leaves end their colorful lives and you’ve taken all the epic fall-color pictures, it’s time to rake and remove. The good news is that you can gather the leaves into a compost pile that will help your garden come spring. If you don’t have room for compost, many cities have leaf pickup days when they come to remove leaves and other yard debris. You might also have a neighbor who is interested in your compostables. Nextdoor is a great network where you might find neighbors with a wide range of interests and information to share. At the very least, raking leaves from your lawn will ensure that your grass doesn’t smother beneath them, causing trouble down the line. As an alternative to raking, you could also use the mulch function on your lawn mower to chop the leaves finely so that they can decompose in your yard. Autumn is a great time to aerate your soil. Aeration keeps your soil healthy and prevents it from becoming compacted, especially as the weather gets colder. Aerated soil is also ripe for fertilizers and seeding. The small holes left from aeration allow the soil nutrients to reach down further to feed your grass from the roots up. Aeration in combination with fertilizers and seeding will help keep your lawn healthy during the colder months to come back refreshed and full in the spring. Fertilization and aeration go hand in hand. Plan to aerate your soil, and then apply fertilizers that will penetrate deep into your grass roots. You can find organic lawn fertilizers designed specifically for winterization, to give nutrients to your landscape even during the colder months. As for when to fertilize your lawn in the fall, aim for 2 to 3 weeks before the ground freezes. The fall is also a great time to test your soil to see what sorts of nutrients it may need, like lime or sulfur. A great time to plan for your full spring lawn is during the fall. Strategic seeding can help repair your lawn from summer brown spot damage, thicken thin grass spots, and ensure your grass returns full and healthy in the spring. Overseeding can also be a great tool in fighting off weeds come spring, as naturally healthy grass is less susceptible to weed infiltration. If your winters are milder, you can aerate and then seed or overseed your lawn in autumn. If you live in an area with harsher winters, waiting until the ground thaws in the spring before seeding would serve you best. You can find the over-seeding recommended rate on the seed product label. Late fall is a good time to trim and prune your trees and bushes. In fact, this should be an annual part of your fall lawn maintenance. Once pruned in their dormancy to remove dead limbs, trees and bushes will return to full vibrancy in spring. The new life and growth is healthy for the plant, and a delight to observe. Pollinators such as bees and butterflies are an important part of nature, and incorporating flowers into your landscape can be beneficial for them. During the fall, you can clear out a patch of grass and plant wildflowers. When they come up in spring, bees, butterflies, and hummingbirds will love the rich repository of pollen. Plus, your yard will have a unique, wild look that your neighbors will envy. Fall planning can help you diversify your landscape and lay the groundwork for a beautiful spring. Fall is the time to plant hardy bulbs. Hardy bulbs are able to survive the winter chill and then blossom forth in spring. In Oregon, plant hardy bulbs at the end of October or in the first weeks of November. You’ll want to keep up on your lawn mowing until your grass stops growing in the fall. 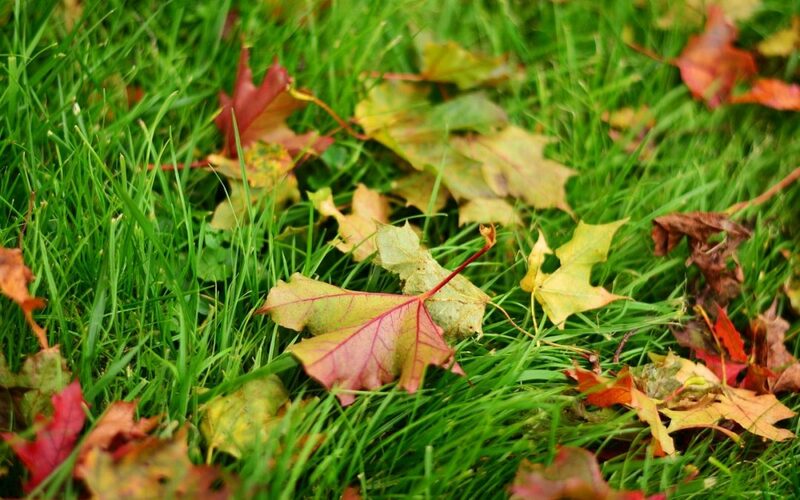 If you choose to use the mulch setting on your lawn mower to address any fallen leaves, you should continue mowing so that the leaves are chopped finely enough to decompose on your lawn rather than suffocate the grass beneath them. Watering your lawn through the fall is also a key component to consider if you live in areas with less rainfall, even as temperatures drop, as a lawn stressed from drought is more susceptible to harm going into the winter. If you live in an area like Portland, the natural rainfall will likely provide plenty of water for your landscape. Crowley Landscape Management can help you both design a residential or commercial landscape that is creative, efficient, and beautiful, as well as provide essential year-round landscape maintenance to make sure it remains healthy. Our landscaping experts can help you prepare your lawn and landscape for the winter to ensure a vibrant, colorful spring season. For a free estimate, reach out to us today!